Today, HRC and Equality NC released new video of an exchange that took place this morning when HRC President Chad Griffin, Equality NC Executive Director Chris Sgro, transgender advocate Candis Cox-Daniels, and other LGBT advocates hand delivered a letter from more than 100 major CEOs & business leaders that urged Governor McCrory and the North Carolina General Assembly to repeal HB 2. A link to the new video is available here. Upon delivering the letter, the LGBT advocates were met by the governor’s chief of staff. After initially agreeing to only allow Griffin and Sgro to meet with the governor, he was persuaded to allow Candis Cox-Daniels, a North Carolinian who is a transgender woman of color, to participate in the private meeting with the governor. Governor McCrory heard firsthand the harm that he and the state legislature are inflicting on LGBT North Carolinians, and particularly transgender North Carolinians--through the enactment of this law. As a transgender woman of color, Cox-Daniels shared the lived experience and personal challenges she has faced. The three advocates urged Governor McCrory to convene a broader meeting with additional members of the LGBT community--and specifically transgender North Carolinians and their families--to discuss the impact of the radical and discriminatory new anti-LGBT law that was rammed through the legislature last week and signed by the Governor in the dead of night. 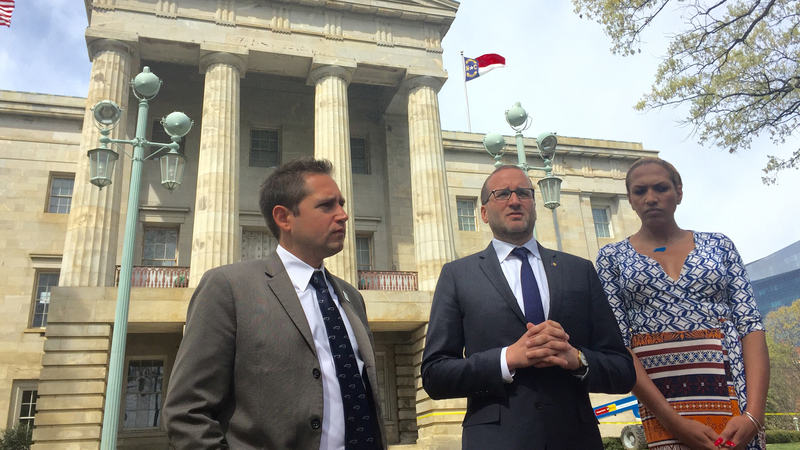 "While we were glad that the Governor agreed to meet with us today to take the first step towards doing the right thing, we reiterated that he must continue to meet with LGBT North Carolinians who are directly affected by the new law,” said Equality NC Executive Director Chris Sgro. “We strongly urged the governor to repeal this harmful bill and restore North Carolina's image by working with the General Assembly to pass comprehensive non-discrimination protections including sexual orientation and gender identity." On Monday, Gov. McCrory claimed, “We have not taken away any rights that have currently existed in any city in North Carolina" -- but PolitiFact rated that claim as false. H.B. 2 has eliminated existing municipal non-discrimination protections for LGBT people and prevents such protections from being passed by cities in the future. The legislation also forces transgender students in public schools to use restrooms and other facilities inconsistent with their gender identity, putting 4.5 billion dollars in federal funding under Title IX at risk. It also compels the same type of discrimination against transgender people to take place in government buildings, including in public universities. Lawmakers passed the legislation in a hurried, single-day session last Wednesday, and Governor McCrory quickly signed it into law in the dead of night.